An alleged 'supernatural sighting' outside the gates of TB Joshua's Lagos-based Church has triggered debate on social media. 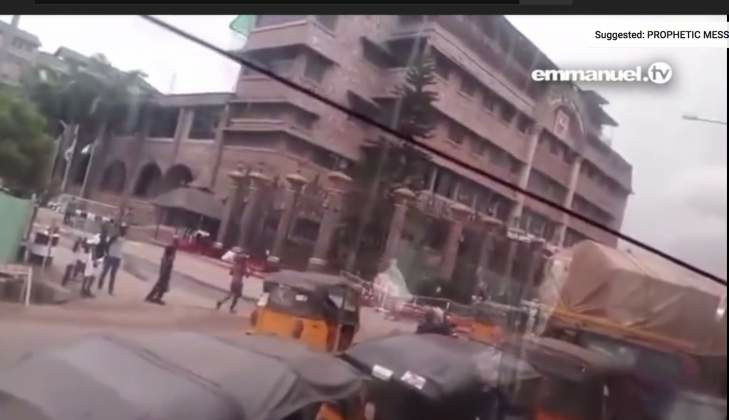 A video uploaded to Emmanuel TV's YouTube Channel, which has subsequently gone viral, shows an onlooker outside The Synagogue, Church Of All Nations (SCOAN) recording the entrance of the church whilst inside a stationary vehicle. Joshua's social media channels requested reactions from viewers, the overwhelming majority asserting that the figure was an 'angel' caught on camera. "I have watched the video 20 times," wrote a commenter known as 'Baty' on YouTube who described himself as a professional graphics editor. "This is not a reflection of any sought, neither is it editing; it's a pure angel," he concluded, citing the height of the 'being' and the speed of its movement. Nnadi Uchenna contributed: "What I saw was not a reflection of any glass or shadow. It was actually a moving transparent object in human shape… For me, it is an angel of God." However, not all were in agreement. "Not all ghost-like creatures are angels; that doesn't look angelic to me," opined Iugano Jackson, corroborated by some who suggested it could even be the 'work of demons'. Others were more skeptical, suggesting it was either camera trickery, the work of computer generated imagery or merely the reflection from the vehicle's glass. "The Synagogue Church Of All Nations is not just an ordinary building or a cinema or a historical sculpture," tweeted Andy Lawrence. "To those whom God will open their eyes will see the angels there!"